Lilywhite Abernathy is a criminal. Her guilt lies in her DNA. Lily is half human, half fae, and since the time before she was born, a war has been raging between humans and faeries. The Queen of Blood and Rage, ruler of the fae courts, wants to avenge the tragic death of her heir—a death that was the fault of reckless humans. 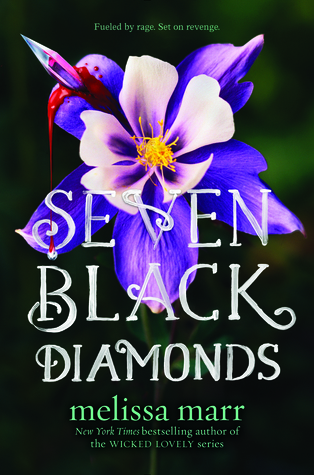 Lily’s father has shielded her from the repercussions of her ancestry, but when she’s sent to the prestigious St. Columba’s school, she’s delivered straight into the arms of a fae sleeper cell --the Black Diamonds. Mysterious, glamorous, and constantly at odds, the Diamonds are planted in the human world as the sons and daughters of the most influential families, and tasked with destroying it from within. Against her will, Lilywhite’s been chosen to join them … and even the romantic attention of the fae rock singer Creed Morrison isn’t enough to keep Lily from wanting to run back to the familiar world she knows. I absolutely, positively adore everything about Melissa Marr's Wicked Lovely series! Her characters, the lush writing, the wonderful attention to detail and mythos. I don't think you understand exactly how much I love her - she was the first author I ever met in person, and asked to autograph my beloved copy of her Wicked Lovely. Melissa will always remain near and dear to my heart, and I am so excited to return to her faery with a new cast of characters.